Forever Toys - Tough For All Birds! A Forever Bird Toy will provide welcome challenge and compliment the destructible-type toys also necessary for your bird's well-being. The Small Bird Bone is good for those "perch potatoes" that could benefit from some more activity, or for those birds that have a little "monkey" in their blood. 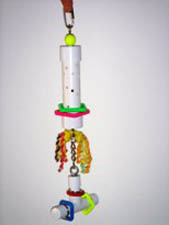 Birds love to climb aboard this perch-type toy and swing around playing with the moving parts. Forever toys offer playthings with interesting variety and something different that your parrot doesn't just chew up and destroy. While chewable toys are necessary for a bird's well-being, these creative toys and perches offer lasting play activity with moving spinners, parts that jingle, and other enhancements that provide stimulation and a welcome change. And they last so can be rotated to other birds in your family, or reintroduced to a single parrot.